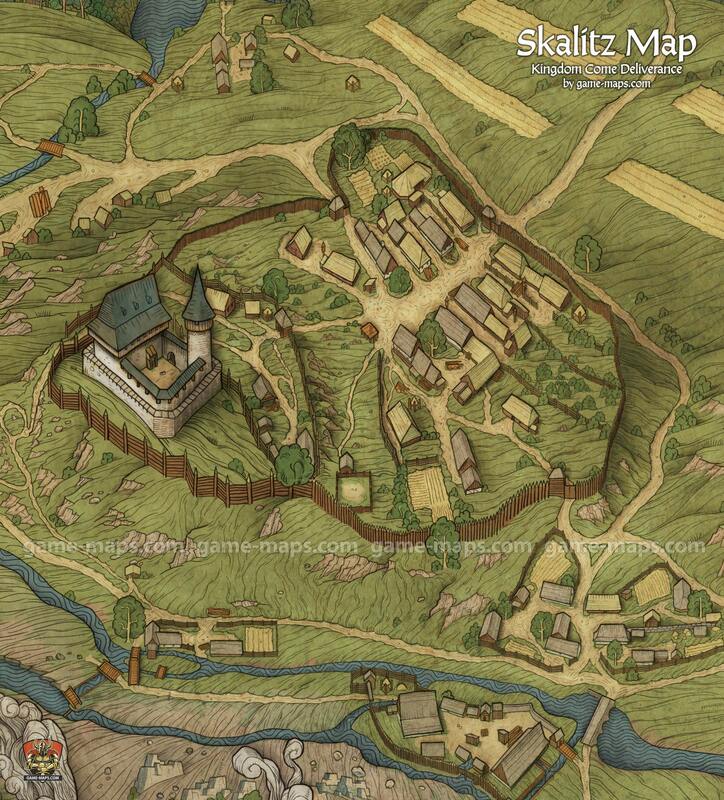 Map of Skalitz Village in Kingdom Come Deliverance KCD Video Game. Little is known about the war in 1402 to 1403, when Sigismund invaded the Czech lands and tried to seize power, and the records that do exist are fairly vague. However, we do know the fate of Silberskalitz, which was burned to the ground on 23 March, 1403. We know the exact date because Sigismund signed a document while in his seige camp that shows he was at Skalitz on that day. Sigismund undoubtedly choose Skalitz because silver was mined here and the town was administered by hetman Racek Kobyla, a supporter of the king. Sigismund apparently wanted to disrupt the flow of money going to the king. According to legend, Kobyla and his people, who were hiding from the attackers in the castle, were able to escape because of a great storm that blew in and forced the beseigers to wait until morning to take the castle. The castle defenders took advantage of this opportunity and under the cover of darkness fled to nearby Rattay. In the morning, the only thing Sigismund's men found in the empty castle was a goat (which is also in the game). Sigismund then razed the town and the castle to the ground and the castle was never rebuilt. Today, only the foundations remain.